He dutifully patrolled the trenches during World War I, alerting soldiers to incoming artillery long before the high-pitched whine was audible to human ears. He used his wet nose to detect gas attacks in enough time to have his men safely don their gas masks. He sat by wounded soldiers as they lay dying in the field. Even after he was injured by gas and wounded by shrapnel, Stubby persevered. He was promoted to sergeant for his fortitude. Not bad for a wayward bull terrier plucked from life as a vagabond and thrust onto the front lines of battle. Stubby came from humble beginnings, roaming the streets of New Haven, and was taken in by Pvt. J. Robert Conroy. It was the beginning of a lifelong friendship marked by unwavering loyalty, heroism and belly rubs. “Look at the lives he saved, and the things he did to save those lives,” says Frank Carrano, a Korean War veteran and history buff from West Haven. Carrano’’s eyes light up when he gets a chance to tell Stubby’’s amazing story to new ears. And he is eager to show off a prized piece of memorabilia that will one day be displayed in the West Haven military museum — a portrait of Stubby painted by Charles Ayer Whipple in 1926. The painting currently resides at Terry James art gallery in Oxford, where owner Terry Waldron restored the piece and has it on display until its new home is ready. Someone from Georgetown University, where Stubby briefly served as the Hoyas’’ mascot, offered to buy the painting and offered any price. But Carrano told him thanks, but no thanks. “I said, ‘The picture’’s not for sale,’’” Carrano recalled. Stubby’’s local connection is too great and too important for Carrano to let him go. It would be like letting history slip out of your hands. Stubby’’s story starts on the Yale Field on Derby Avenue, where members of the 102nd Infantry, 26th Yankee Division, were preparing for war. Stubby wandered onto the field during training and was adopted by Conroy, who named the dog for his short stump of tail. Unable to leave the dog behind, Conroy smuggled Stubby onto a train to the coast and hid him in his overcoat as he boarded a ship for Europe. After being discovered on the vessel, the stowaway dog quickly won over the war-bound soldiers and served as a morale boost during the ominous journey. The men taught Stubby tricks, and before long he was able to salute on command by holding his paw up to his face. Once in France, Stubby served on the front lines alongside his master and comrades. In 1918, he was injured from exposure to gas, but recovered in the hospital and developed a keen ability to smell the gas. As the story goes, when Stubby detected an oncoming gas attack, he barked at and bit the soldiers to wake them up and ended up saving many a life. For Carrano, Stubby’’s most heroic — and unbelievable — contribution to the war came when the dog darted out of the trenches and attacked a soldier who turned out to be a German spy mapping out the Allied positions. Stubby’’s feat may have thwarted a deadly attack by the Germans. He was promoted to sergeant for capturing an enemy spy. Later, he was wounded by shrapnel during an attack and rushed to the field hospital. As Stubby recovered from his wounds, he had the run of the hospital, says Carrano, and spread cheer by visiting the wounded soldiers. According to historical accounts, Stubby served in 17 battles. When he returned to the United States, still alongside Conroy, he quickly rose to celebrity. Stubby marched in parades with his military jacket, laden with medals, chevrons and honors bestowed on him by the government. He even had lunch with President Woodrow Wilson. When Conroy went to Georgetown University to study law, Stubby came along and served as the mascot for the Hoyas. The many adventures of Stubby the war dog were passed down generation to generation, and Carrano learned some of what he knows about the dog from World War I veterans he used to know. 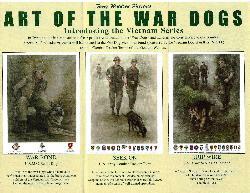 But the dog-hero’’s exploits are chronicled in numerous publications as well. His obituary ran in the New York Times on April 4, 1926. Stubby was preserved after his death and is on display at the Smithsonian Institution’’s Price of Freedom exhibition. Soon, his portrait will be on display at the West Haven military museum, slated to open Memorial Day 2010. 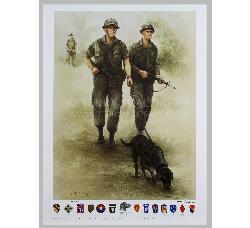 The painting was displayed for years in the 102nd Infantry Regiment museum run by Carrano out of the armory in New Haven. When Waldron visited the museum to take a look at the painting, she was stuck by its flaking and fading condition. “When I saw it, I said, ‘My goodness, this has to be restored.’’ This painting is too special to just let deteriorate,” she said. 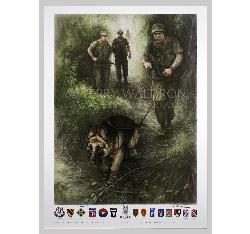 So Waldron, an artist with a special place in her heart for military dogs, offered to do the work for free. She restored the painting and has had it on display in her gallery in Oxford for eight years, awaiting its new home. 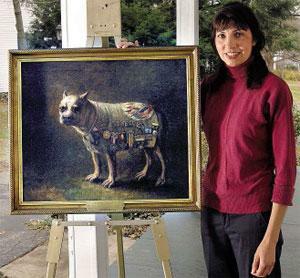 Waldron admits she will be sad to see Stubby go, but she has painted her own version of the canine hero. Carrano says Stubby is not just an unlikely military hero and wartime morale booster, but a symbol of the bravery shown by all soldiers who fought in World War I as well as wars before and since. With Americans still fighting in Iraq and Afghanistan, he says it is more important than ever to remember our veterans. “The outcomes of wars past is the freedom that we still enjoy today,” he said. by Abbe Smith New Haven Register, Ct. 2009 THE STUBBY STORY Stubby joined the 102nd Infantry, 26th (Yankee) Division, at Yale Field, New Haven, CT, in the spring of 1917. It is not known where he came from or what his pedigree was, but he appeared to be several weeks old at the time of his arrival. Throughout his service, his caretaker was J. Robert Conroy. In July 1917, he was smuggled aboard the S.S. Minnesota at Newport News, VA, and sailed to France with his unit. Following winter training of his unit, Stubby went to the front and was in the trenches February 5, 1918. He participated in 17 engagements in four World War I offensives (Aisne-Marne, Champagne-Marne, St. Mihiel, and Meuse Argonne). After the Armistice, Stubby met President Woodrow Wilson when the President visited the 102nd Infantry regiment in France on Christmas Day 1918. When Stubby's unit returned to the United States in 1919, the dog was again smuggled aboard ship for the return trip. Stubby participated in many veterans' parades in many cities and attended every American Legion convention until his death. He appeared in a series of vaudeville shows in 1919 on the same bill with Mary Pickford. He visited the White House in 1921 to meet President Harding and again in 1924 to meet President Coolidge. In 1921, General John J. Pershing awarded a gold medal to Stubby. In 1922-23, Stubby was official mascot of Georgetown University while his master was attending law school. Stubby died in 1926, and his remains were preserved with technical assistance from the Smithsonian Institution. A plaster cast was made of his body, his skin was mounted on the cast, and his cremated remains were interred within the cast. For many years, he was on display at the National Red Cross Museum. On May 22, 1956, his master, J. Robert Conroy, presented Stubby to the Smithsonian. Included with the gift were a brass-studded collar, a leather harness, a scrapbook containing the history of Stubby, and a chamois blanket decorated with various badges, medals, and insignia of World War I. See “Sgt. 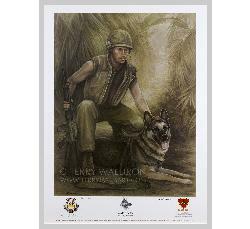 Stubby - WWI US War Dog Hero”, A Limited Edition print by Terry Waldron .Click on "Featured Artis", and Terry Waldron for details. 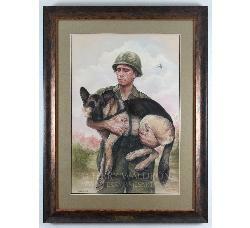 This is not painting by Charles Wipple but Terry Waldron's New Rendition of Sgt. Stubby-WWI War Dog Hero. Published by Terry James Art 2006 as a limited edition, 26 Giclee on Canvase, 76 Giclees on Archival Paper and 25 Publisher Proofs.Copyright Terry Waldron 2003. All plates and means for reproduction have been destroyed and will not be reproduced in this format again.